Sri Ramakrishna is recognised as one of India’s greatest spiritual figures. His message of complete God-love and the inherent unity of all world religions drew to him a great number of followers – an influence that continues to this day. Sri Ramakrishna was himself uneducated yet he drew many distinguished people to visit and and listed to his simple but profound wisdom. A notable admirer was Keshab Chadra Sen, the leader of the Brahma Samaj. His intense devotion and radiant spirituality also drew a close circle of disciples who would later spread his message. The most famous of these disciples was Swami Vivekananda. It was Swami Vivekananda who took the message of Vedanta to the West. 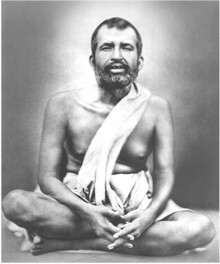 Sri Ramakrishna was married to Sarada Devi. During his lifetime Sarada Devi was a devoted wife and disciple of Sri Ramakrishna. After his death Sarada Devi played an important role in leading the Ramakrisna order. Sri Ramakrishna Math is a place of pilgrimage, situated at Mylapore in Chennai. Commissioned by Swami Vivekananda, this Math was started by Swami Ramakrishnananda, a direct disciple of Sri Ramakrishna. The Math campus is filled with palpable holiness. Anyone who sits in the temple, even if it is for a few minutes, feels the supreme calmness descend on him. With its lush green surroundings, the Math is a lovely spot for contemplation and meditation.